If you've lately taken a stroll by the beach along JBR, chances are you've seen this giant tower - a white spiral frame which seems straight out of an interplanetary handbook - ready to shoot a spacecraft into the sky. Fascinating as that may be, the structure, in reality, is the latest addition to Dubai's endless list of aerial adventures. And thrill seekers looking for something unique can now head up there for a cup of their favourite beverage. The attraction is called the Flying Cup and those eager to try it out will be suspended from a height of 40 metres above The Beach at JBR to enjoy a mocktail in the sky. As a myconcierge member, you will also get a pair of binoculars for a closer look at your surroundings or a souvenir mug to take home with you. Set against the Arabian Gulf with magnificent views of Ain Dubai on Bluewaters Island and Palm Jumeirah, the Flying Cup offers 360-degree panoramas of the city from a unique vantage point. The experience, which lasts for up to 20 minutes, sees you first being securely strapped in to a chair around an oval rotating platform. You then gradually ascend, soon reaching the height of a 12-storey building, where you can enjoy your refreshment while soaking in the views. What makes this the perfect experience for those looking for an adrenaline rush is that there's no base to the platform, which means your feet are dangling in the air, 40 metres high above the beach. As the organisers put it, the Flying Cup allows you to enjoy three experiences in one - mesmerising vistas of the city, the rush of being suspended in the sky and your favourite drink. The rotating platform allows you to enjoy different angles of the city below, making for many Instagram-worthy moments. The Flying Cup is also available for private events. Those looking to celebrate a special occasion with a unique twist can get in touch with us at 800-CONCIERGE and we will organise a memorable experience for you. With so much to offer, the Flying Cup truly promises to, quite literally, elevate your adventure in the city. Children three years of age and below are not permitted. The organiser may postpone, delay, cancel, interrupt or stop the event due to adverse weather, dangerous situations, or any other causes beyond reasonable control. 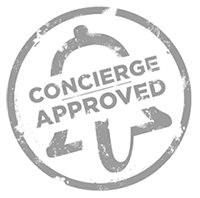 If you need to cancel a booked service, it is mandatory to use the relevant form on the myconcierge.com website (found in your User Profile under Booking History) or to email us at [email protected] with your Booking ID. The refund will be made within 20 working days by crediting the credit card used for booking. No refund will be made if you cancel a booked service 72 hours or less before the experience or in case of a no-show.